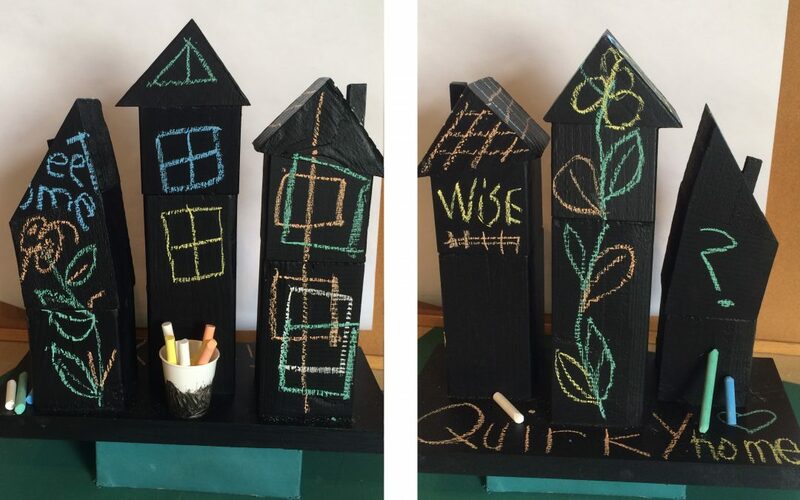 This year is the 12th Annual “Albuquirky” Little Houses Silent Auction Fundraiser for Off Center Arts. Each year, local artists are given little wooden houses to turn into one-of-a-kind works of art, which are then auctioned off to raise funds for a worthy cause. My assistant, Deb Weaver, and I are happy to participate again this year. My contribution this year is “Chalkboard Condominiums” — a fun, family communication center. My assistant, Deb Weaver, who is a textile artist, created a Fairy House using scrap yarn, upcycled styrofoam, jewelry, buttons and other items. It’s always fun to create art for a good cause, especially Off Center Art’s all-inclusive arts studio where the process of making art within a supportive community and a safe environment provides all the therapeutic and healing aspects of art — especially for those most marginalized in our community.